Sun City Oro Valley is a beautiful 2,400-home community 20 miles north of downtown Tucson, AZ. It spans over 1,000 acres and was built by Del Webb between the late 1980s to mid 90s. The community is well known for its magnificent views of the adjacent Santa Catalina Mountains, outstanding golf, reasonable home prices and a vibrant social calendar. Del Webb combined several decades of active adult construction experience when designing this community. It boasts an exciting lineup of amenities uniquely crafted for active adults who want to enjoy a physical and socially active lifestyle. Sun City Oro Valley includes three recreation centers. The Mountain Vista Recreation Center has a large sports and activity complex with a fitness center, dance studio and auditorium. Plus, there is a craft facility with ceramics, clay, lapidary, sewing and woodworking shops. Outside, there is a large outdoor lap pool, tennis courts, pickleball, bocce ball, shuffleboard and a miniature golf course. The Desert Oasis Recreation Center has several multi-purpose rooms, outdoor pool, tennis courts and basketball court. The third clubhouse, Catalina Vista, includes several art and crafts studios, a photography room and billiards. This Arizona community is home to a semi-private 18-hole championship golf course. The 6,759-yard par-72 The View Golf Club at Oro Valley was designed by Hall-of-Famer Greg Nash. It intertwines harmoniously with the natural desert surroundings and provides breathtaking views of the nearby mountains. There are multiple tee placements for golfers of all skill levels. The course is open for public play but there are membership options. Homebuyers have numerous real estate options in Sun City Oro Valley. There were nearly 50 different floor plans offered throughout the construction of the community. Buyers can select from single-family and attached garden villas that range from 1,035 to over 2,700 square feet. An ever-changing lineup of pre-owned homes are available at reasonable prices. Most of the homes in this active adult community are 15 to 20 years old. A growing number of available resale homes have been retrofitted with the latest modern finishes including upgraded kitchens and bathrooms. Residents of this community have the opportunity to participate in countless clubs and activities. There are several dozen clubs and interest groups that include everything from cards and craft clubs to tennis and golf. There are also many activities that promote health and well-being such as weight training, water aerobics, yoga and dancing. Regardless of your lifestyle interests, you will surely find other homeowners in Sun City Oro Valley who are similar to you. Sun City Oro Valley is located in the town of Oro Valley, Arizona. This tranquil town just north of Tucson sits in the foothills of the towering Santa Catalina Mountains. Oro Valley provides residents the perfect blend of suburban solitude with big city conveniences. Surrounding the community, residents enjoy a growing contingent of popular retail outlets and great restaurants. Plus, downtown Tucson and its many attractions are a quick 30 minute drive to the south. This community is perched at an elevation of 3,000 feet where it enjoys slightly cooler summers than the lower desert communities of central Arizona. It is adjacent to the Catalina State Park and Coronado National Forest. Outdoor enthusiasts have access to over 1.78 million acres of unspoiled natural beauty. The mountains in the park climb to more than 9,100 feet and provide great hiking, biking, skiing and camping. Catalina Vista has many meeting rooms and is located at 14055 North Del Webb Drive. The Artisan Center is a great place for creative projects and is located at 1495 E. Ranch Vistoso Drive. The Desert Oassis is located at 14650 N. Sun City Blvd. Here you will find many fitness and social activities. It is located 1495 E. Rancho Vistoso Blvd. The Welcome Center houses administration and meeting rooms. It is located at 1565 E. Rancho Vistoso Bldv. There are plenty of activities available in Sun City Oro Valley. Here is a sample of some of the clubs, activities and classes offered here. Attached homes are a great low-maintenance options. There are approximate 1,000 to 1,400 square feet in size with two bedrooms, two bathrooms, and an attached one-car garage. Note: Not all attached floor plans are available at this time. There were many single-family homes built in Sun City Oro Valley throughout the years. Homebuyers can select a resale homes that has 1,035 to 2,665 square feet in size. Most homes have one to three bedrooms, one to three bathrooms, and an attached garage. residents. Just like the Pioneers of old we had the backbone to pull up stakes to find a new home to enjoy our senior years. We found it! Come visit us and learn why for yourselves. After ten years, I am still astonished at the quality of this community. Everyone has updated their homes. Our common areas and buildings are kept in tip top shape. Most importantly, this is truly a community. Here we all volunteer to serve on an assoc. committee or serve the club that's of interest to us. We are very, very active. There is plenty to do if you're a "doer" and plenty to enjoy if you are not. Just a walk down the street brings waves and greetings. Everyone that lives here feels safe, respected and that they belong to our "family". A truly great place to live. I have lived in SCV for almost 20 years. It is the best move we ever made. 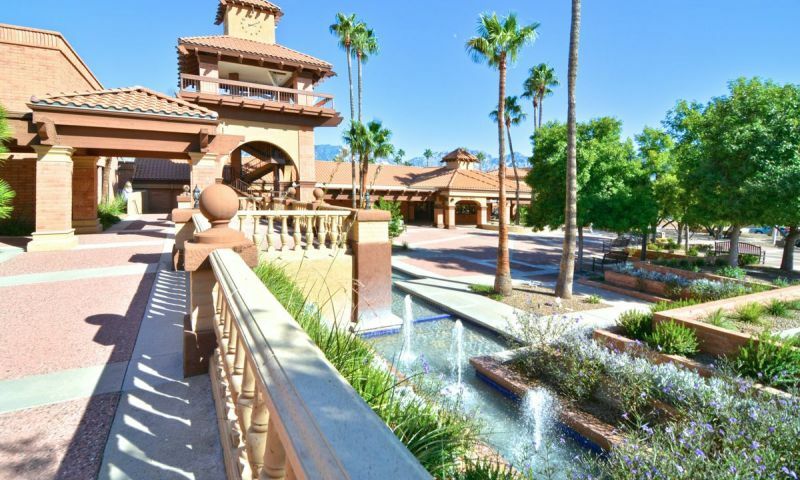 The community is small compared with other Del Webb sites but with the most fantastic views. Outside of Tucson in the high desert, we have idea weather for outside activities and there are more activities and clubs than imaginable. A championship golf course, tennis courts, pickleball, art, dancing, continuing education, woodworking, lapidary, ceramics,hiking, and computer classes are just be a few of the many activities available. We have a cafe' on site with catering capability for the many neighborhood parties that are planned throughout the year. This a "the place to live an active life!" 55places.com is not affiliated with the developer(s) or homeowners association of Sun City Oro Valley. The information you submit is distributed to a 55places.com Partner Agent, who is a licensed real estate agent. The information regarding Sun City Oro Valley has not been verified or approved by the developer or homeowners association. Please verify all information prior to purchasing. 55places.com is not responsible for any errors regarding the information displayed on this website.